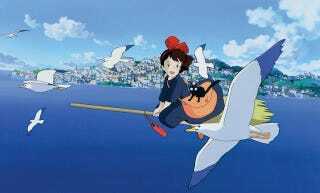 Fans of anime legend Hayao Miyazaki, the wonderful works of Studio Ghibli, or just really good family movies, rejoice: A live-action version of Kiki's Delivery Service has been announced. The movie will be directed by Takashi Shimizu, who also directed the horror movie Juon (a.k.a. The Grudge) and will star 16-year-old ice skater-turned-actress Fuka Koshiba as Kiki. The film won't actually be based on the classic anime movie, but on Eiko Kadono's original series of children's books, about a young witch who sells her magic abilities. Apparently, the movie ended up quite different from the books, which the author was reportedly unhappy about. Still, given how insanely popular the movie was (and still is), I'd be shocked if it doesn't influence this new movie in some way.